Currently Dr. B.R. Das is working as the Advisor and Mentor -Research & Innovation at SRL Limited, Mumbai. Apart from R&D, he also acts as the Mentor of the Molecular Pathology and the Clinical Research Services of SRL. He has more than 30 years of experience in the area of Molecular Medicine. Before his association with SRL he worked as a Professor in Medical Biotechnology for nearly 15 years. He has published more than 100 research papers in peer reviewed International Journals. Several Ph.D. and post-doctoral Scientists have completed their clinical research work under his guidance. His research work has been highly acclaimed in India and abroad for which he has been honoured with several prestigious awards such as the Best Young Scientist Award given by Indian National Science Academy (INSA), Indian Science Congress Association (ISCA) Young Scientist Award, MP Young Scientist Award, KI Memorial Award for promotion of Medicine Research in Japan, Samanta Chandrasekar Award from Orissa Bigyan Academy. He has also worked as a visiting scientist in Case Western Reserve University Hospital, Cleveland, USA, and Kyoto Medical School, Kyoto, Japan. He has been nominated as a member of International Affairs Committee (IAC) of Association of Molecular Pathology (AMP), USA for South Asia including India. He has also been invited by the Association of Indian Pathologist of North America (AIPNA) to work as an Expert member in the Molecular Path Committee. He acts as Scientific Advisory Committee Member, Visiting Professor and Research guide at several reputed Institutes of India. Besides, he is an Editorial Board Member of World Journal of Experimental Medicine. In 2014 he received the Technology Achievement Award by EET CRS. He is also the current President of the Molecular Pathologists Association of India (MPAI). Dr. Yuan-Hao Lee was born in Taipei, Taiwan and received her PhD degree in the Radiology Department of University of Texas Health Science Center in 2013. Before Dr. Lee's PhD studies, she has finished six years of professional and advanced training in biomedical imaging and radiological sciences. Dr. Lee is experienced at the investigation of radiation-induced DNA damage response and oxidative stress as well as the relevant cell signaling. At present, Dr. Lee conduct and participate in clinical research as a medical physicist with other medical staff in the Taipei Municipal Wanfang Hospital, Taiwan (R.O.C.). Dr. Lee is serving in the SIT (Scholar-in-Training) committee of the Radiation Research Society (USA) as well as the scientific program committee member of the 1st Asia-Pacific Forum on Quality and Safety of Medical Imaging (APQS2015). In Dr. Lee's PhD studies, the radioprotection and radiosensitization effects from natural compounds were mechanistically investigated using both benign and tumor cell models. Yuan-Hao found a niche for ursolic acid to sensitize skin cells to UV radiation as well as the potential of ursolic acid in protecting retinal pigment epithelial cells from UV irradiation. In addition, Yuan-Hao worked on the development of an oxidative stress biosensor for monitoring real-time formation of intracellular ROS (reactive oxygen species). During Yuan-Hao's postdoctoral trainings in the NCI-designated cancer centers, she involved in the studies of radiation-induced cancer susceptibility and DNA repair pathways, including signaling in relation to Fanconi Anemia and estrogen receptors. I received my Ph.D. degree in Neuroscience and oncology from the University of Limoges, France in 2006. I worked for 1 year in Paris on pediatric brain tumors and the characterization of cancer stem cells in these tumors. I followed my post-doctoral experience by collaborating and working for 3 years on GLIADYS project with IDD-Biotech (International Drug Development Biotech), specialized in monoclonal antibodies production in Lyon, France. The project consisted to develop new therapeutics for gliomas. During this project, I develop partner relationship with Oncomedics (society specialized in Individualized tumor response tests). I’m currently a full-time assistant-professor at the University of Limoges in the Department of Physiology and I’m leading research into the homeostasis cellular and pathologies team. My current research activity is focused on cancer stem cells in glioblastoma and the role of neuropeptides in their therapeutic resistance capacity. Dr. Amikar Sehdev is an Assistant Professor of Medicine in the IU School of Medicine’s Division of Hematology Oncology. Dr. Sehdev is a practicing academic medical oncologist with extensive training and experience in cancer, public health, genetic epidemiology and cancer prevention research. He did his medical school training in India and was the recipient of the National Merit Scholarship. After coming to United States, he completed a Masters degree in public health at Northern Illinois University and residency training at the John H. Stroger Jr., Hospital of Cook County. He was then accepted into the prestigious hematology/oncology fellowship program at the University of Chicago. Dr. Sehdev specializes in gastrointestinal cancers and melanoma. In addition to his clinical responsibilities, Dr. Sehdev’s primary research is focused on studying the metabolic risk factors of colon cancer, understanding their molecular mechanisms and developing prevention and treatment strategies for the same. Dr. Sehdev has formal training in cancer epidemiology and bioinformatics and is a member of Cancer Prevention and Control Program at the IU Simon Cancer Center, Department of Epidemiology at the Richard M. Fairbanks School of Public Health and Center for Health Services Research at the Regenstrief Institute's to pursue these research interests. Dr. Sehdev’s secondary research interests include development of newer and improved treatments for patients of gastrointestinal malignancies and melanoma. 1. Cancer epidemiology including genetic epidemiology and cancer outcomes. 2. Health services research. 4. Clinical trials in gastrointestinal cancer and melanoma. Dr. Jyoti Bajpai is a medical oncologist and at present posted as the Associate Professor of Medical Oncology, at Tata Memorial Hospital in India. She received her MBBS (with Merit Certificate for Medicine and Pediatrics) and MD in general Medicine from NSCB Medical College, Jabalpur and DM in medical oncology from All India Institute of Medical Sciences (AIIMS), India. She did observership in “Sarcomas” from Johns Hopkins Cancer Center, Baltimore, Maryland, USA. Her main interest includes breast cancer, sarcomas and gynaecological cancer managements. She is also having a keen research interest with 38 publications to her credit. This includes 14 original articles as first/corresponding author in international and national Journals. She has presented several papers in international and national conferences. She received the best poster award in International Society of Paediatric Oncology Congress (SIOP), Toronto in 2014, and her project ranked highest in Australia and Asia Pacific Clinical Oncology Research Development (ACORD) Workshop. Dr. Jyoti is a part of many major international and national trials at Tata Memorial cancer Center. She is currently affiliated with Indian cancer congress, Indian Musculoskeletal Society, Association of Palliative Care, ISMPO and ICON. I am Ayman Rasmy- Egyptian with MD in Medical Oncology (Nov.2009) with a license as a consultant medical oncology from the Egyptian Medical Syndicate (Jul. 2010) and from the Saudi Council for Health Specialties since Apr.2014. Currently, I am working as a Consultant Medical Oncology in King Saud Medical City-Riyadh since July 2016 with experience as an assistant consultant in King Fahad Specialist Hospital-Dammam- from Jan.2011-July.2016. 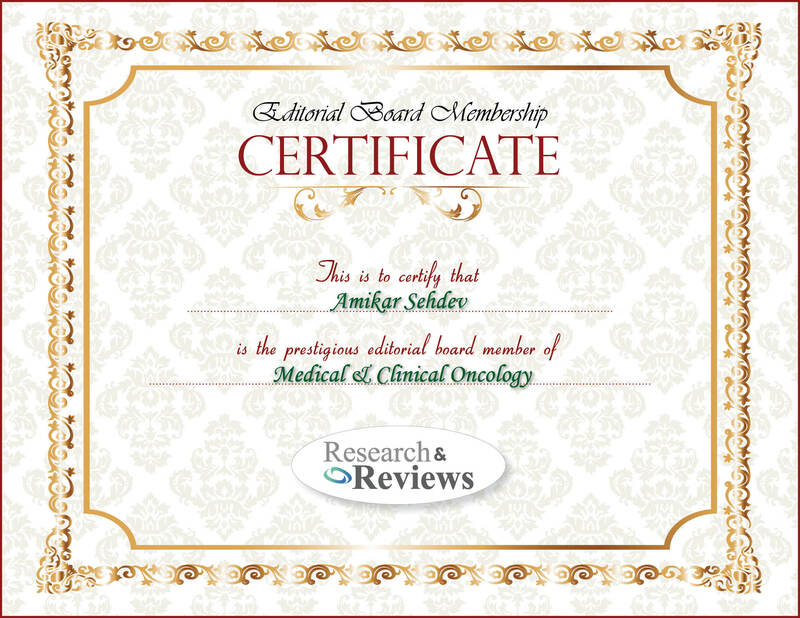 My education, training, and experience since 1999 have given me an opportunity to develop a good background in the field of Medical Oncology. -Participating in the development of medical services, including standard procedures, management of activities related to patient care, and standard procedures. -Contributing towards the improvement of the efficiency of my department -Participating in the research as principal or co-investigators. -Participating in the educational activities in my Hospital. Rony Benson received his MBBS degree from Govt. Medical College Thiruvanthapuram, done his postgraduate in Radiotherapy from All India Institute of Medical Sciences, New Delhi. He also worked as senior resident in All India Institute of Medical Sciences, New Delhi in the year 2016. He has many of his research publications in various Journals and he is serving as the Editorial Board member for many Journals too. Dr. Kurtulus Gokduman received his B.Sc. degree in Biology, M.Sc. degree in Biotechnology, and Ph.D. degree in Biotechnology from Middle East Technical University, Ankara, Turkey. During his Ph.D. studies, he focused on the development of molecular genetic tools for Salmonella detection, as well as on the development of targeted and sustained delivery of Camptothecin anticancer drugs in bioactive form using iron oxide micro and nanoparticles. These researches have led to several publications and national/international patent applications. He performed post-doctoral research at Harvard Medical School, Harvard University, Boston, MA-USA, on the development of tumor on a chip test platform for bacterial cancer therapy, as well as on the investigation of hepatotoxicity profiles of super paramagnetic iron oxide nanoparticles using primary rat hepatocyte models. Currently his researches focus on cancer nanotechnology applications involving super paramagnetic iron oxide nanoparticles; bacterial cancer therapy; early diagnosis of cancer and other diseases using miRNA expression levels; treatment of cancer and other diseases using stem cells; and the development of tumor/organ on a chip models for medical diagnostics, targeted drug delivery, drug screening, and toxicological studies. Mr. T. Manikandan is an Associate Professor working at Rajalakshmi Engineering College, Thandalam, Chennai. He is pursued his Ph.D in “A study on computer-aided diagnosis systems for lung cancer detection and its three dimensional visualization using machine learning techniques” at Anna University, Chennai. He did his bachelor’s degree in Engineering from Vellore Engineering College, Chennai under Madras University & master’s degree in Engineering from College of Engineering, Anna University, Guindy, Chennai during 1998 & 2007 respectively. He is having 18 years of teaching experience which includes both UG and PG. He also guided many projects at UG & PG levels. He has 20 papers in international journals and conferences in his credit. Feifei Pu is an Attending Physician in Department of Orthopedics, Union Hospital, Tongji Medical College, Huazhong University of Science and Technology, China. He has doctoral degree in surgery from Huazhong University of Science and Technology, China. He has several publications in various oncology and orthopedics journals. He is member for several society and journals too. His research interest includes tumour biology, orthopedics, bone tumour, etc. Dr. Ricardo Bonfim Silva is Bachelor in Biological Science with emphasis in Genetics by the State University Southwest Bahia-Brazil, Master and Ph.D. in Genetics by the Medical School of Ribeirão Preto of the University of São Paulo (FMRP-USP-Brazil) and concluded a Ph.D. research internship at Indiana University School of Medicine of the Indiana University-Purdue University Indianapolis-USA. Currently he is Posdoctoral fellow at Molecular Biology Laboratory at FMRP-USP and conducts research in the Molecular Neuro-oncology area, specifically in Medulloblastoma. He has experience in Tumor Microenvironment, LncRNA, Bone Marrow transplantation, Mesenquimal Stem cells, Human and Medical Genetics, and Molecular and Cell Biology ,and he is reviewer of some Research Journals and has publications in those areas. Dr. Abid grew up in the southern coastal city of Pakistan, Karachi and then in Meridian Mississippi. From early days of school, he developed a keen interest in Basketball and represented several teams around the world. He attended medical school at the prestigious Aga Khan University in Pakistan, completed USMLE board exams with stellar scores and completed internship from Penn State University Hershey Medical Center in Hershey Pennsylvania. He then moved to Singapore and completed residency training at the ACGME- accredited National University Hospital Singapore. Following his long terms interest in academic hematology, Dr. Abid continued to publish and present at international conferences and completed a year of medical officership at the National University Cancer Institute of Singapore. He is currently a specialist registrar in hematology at the University of Bristol Cancer Institute UK. He has several original research papers to his credit and serves on the editorial board of various international journals. He loves to spend time with his wife and daughter, traveling with them and continues to follow NBA. Professor Melissa A. Bray is a Fellow of both the American Psychological Association and the American Psychological Society. Dr. Bray is an elected member of the Society for the Study of School Psychology. She is licensed as a psychologist in the State of Connecticut, holds national certification in school psychology, state certification in school psychology and licensure in speech language pathology. Since receiving her doctorate in 1997, she has published or has in press over 175 articles, chapters, and reviews in the professional literature, and has presented over 90 scholarly papers at national and international conferences. In a recent study it was determined that Dr. Bray was the most prolific contributor to the 5 primary journals in school psychology. Further, she serves as associate editor of the International Journal of School and Educational Psychology and has served as an associate editor of School Psychology Quarterly. She is on the editorial boards of the Journal of School Psychology, Gifted Child Quarterly and the International Journal of School and Educational Pyschology. Of interest, she is the co-editor of the first Oxford handbook of school psychology. She has also guest edited 8 issues of Psychology in the Schools on video self-modeling, behavior disorders, positive psychology, statistical reform, childhood obesity, counseling and emotional disorders. As co-principle investigator, she has secured over $ 1 1/2 million dollars in student training contracts. Of particular significance, Dr. Bray was the 2003 recipient of the prestigious American Psychological Association Division 16’s Lightner Witmer Award, the Division’s highest honor given to young scholars. She has also been involved in state, national, and international professional associations including service as Vice-President, Social, Ethical Responsibility, and Ethnic Minority Affairs, APA’s Division 16 Executive Committee. Dr. Bray has also served as the Division 16’s convention chair, hospitality suite coordinator, chair of the Division’s publications committee, and as a member of the conversation videotape series. Her research interests are in the area of interventions for communication disorders, classroom disruptive behavior, and physical health and wellness, especially asthma and cancer. She completed her undergraduate and master studies in nursing at the Esfahan University of Medical Sciences as Medical Surgical Nursing instructor. She has been involved in nursing education since 1997 in Iran University of Medical Sciences as faculty member and in 2012 holds a PhD of nursing education. Her professional activities are based on Clinical education, orthopedic nursing, Nursing education and Management. She is also: Member of academic consultant committee, Member of Nursing Organization of Iran as scientific consultant, Editor of “AVEDIS” public health education magazine (in Armenian language), Member of Iranian Cardiac Nurse Society, Member of Avedisian clinic management board since 2002-2010, Member of Armenian schools educational consultant board since 2006.She has many other activities related to her profession as teaching in workshops and short courses as: Qualitative and quantitative research methods, Pain, Nursing interventions, Reporting, Physical examination as nurse and so on. She served as a nursing director managing nursing research, staff development, case management and advanced practice nursing for Tehran hospitals. She has several books, articles and lectures which you can see in her CV. ♦ Winner of National Scholarship –Sponsored by Govt. of India, Year 1993 Prior to joining Reliance Life Sciences, he was associated with India’s leading pharmaceutical and Contract Research Organizations such as Ranbaxy & Cadila Pharmaceuticals Ltd. He has authored several national and International publications in reputed journals.